With the exception of two minor items, the hallway bathroom demolition is finally finished. I was beginning to think I’d never get to this point! But I did it. All of the rubble has been cleaned up and hauled away, and I’m left with nothing but a shell. 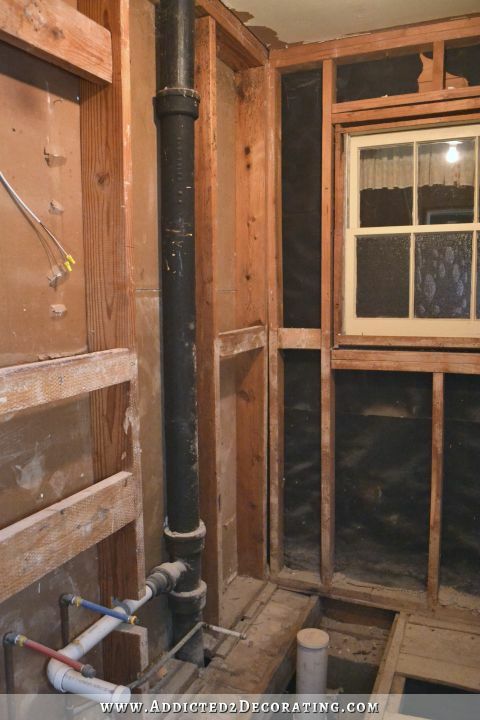 So this should be the last post about this bathroom that is filled with ugliness, but I wanted to be sure to show you what I’m starting with as I begin to rebuild in here. But first, let me just tell you that good neighbors are worth their weight in gold! When Matt and I finally decided that we weren’t going to do any major remodeling to this bathroom, I had to decide whether to keep the old cast iron bathtub or replace it. I went back and forth on that decision, and finally decided to replace the tub. 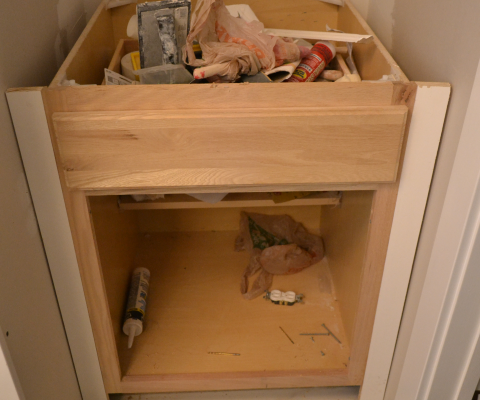 But then I was left with the task of getting that old tub out of there. There was no way I could do that on my own, as that old cast iron tub weighed several hundred pounds. I also didn’t know how to get the drain off of the tub. I’m pretty sure it had rusted on there, and no matter how much I tried to turn and twist, it wouldn’t budge. Remind you of anything? Remember that nest I found under my kitchen cabinets? Yeah. Same thing here. Some critter had obviously made itself at home under my tub, and brought in all kinds of leaves and straw to make its nest. You’ll notice above that I still have the old galvanized pipes on the tub. When the plumber was here to fix the sewer pipe for the toilet, I was still of the mindset that this was going to be a temporary bathroom makeover, and that I’d be doing a full remodel in two or three years. So I told him not to worry about the tub pipes right now. They’re definitely corroded inside, like old galvanized pipes get, but I was certain they’d last at least three more years. But now that this is the final remodel, I’ve scheduled him to come back to replace those old pipes. I also still need to get this old window out of here. For a temporary makeover, I was planning to keep the window because it does let in lots of natural light during the day. But for a final remodel, it needs to go. It was originally an exterior window, but now it looks out into the sunroom, and that area behind the bathroom will eventually be a hallway. 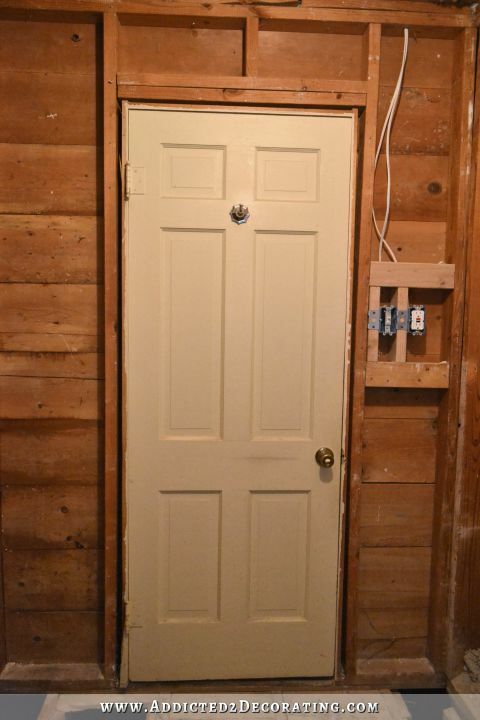 I haven’t taken it out yet because that would give my cat free access to this room…and the crawl space under the house. So I’m holding off until I’m ready to put up that sheet of drywall. And finally, I still need to get the sheetrock off of the ceiling. I was holding off on that until the squirrel guy was finished (i.e., squirrels out of our attic and entries patched up). He finished up last Friday, so I can get that done today. So the good news is that I’ve made a ton of progress. Every bit of the old tile and mortar is gone (39 bags total!!). The drywall is gone (except for the ceiling). Everything is cleaned up, and I’m ready to start rebuilding in here. The bad news is that I would have been a lot further along except that I ran into a pretty significant problem. I cut the first piece of plywood subfloor, carried it into the bathroom by myself, wrestled it into place around plumbing pipes, while trying to keep my balance on floor joists without falling into the crawl space, and finally got it into place. It was too long on one edge, so I had to wrestle it out, recut, and try again. I did this a total of about four times before it finally fit flat on the floor joists. But something still wasn’t right. It just felt funny. By this time, I was so incredibly frustrated that I was about ready to throw in the towel. After much yelling and temper tantrum-throwing, I realized that the problem wasn’t me or the plywood. 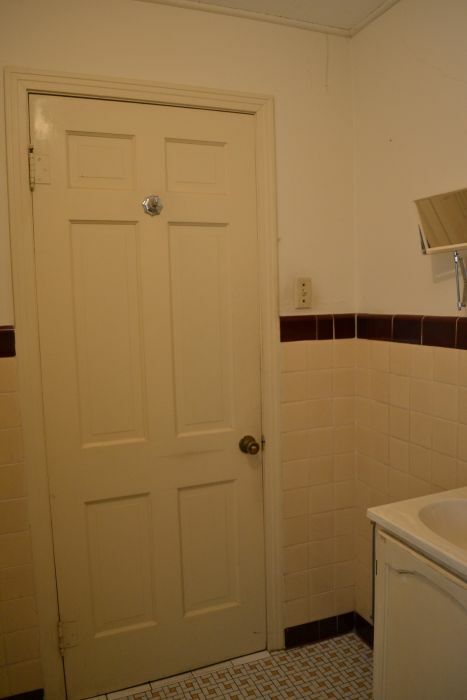 The problem was that the floor in this bathroom is seriously unlevel. The window wall is 1.5 inches higher than the door wall, and that’s in a span of space that’s not quite eight feet wide! And inch and a half!! So I called the company that leveled our house last year, and they’re trying to fit us into the schedule ASAP to fix the problem. Thankfully it’s still under warranty, so this shouldn’t cost us anything. Unfortunately, that meant that my work on the bathroom came to a complete stop on Friday. I was hoping to get the subfloor down, the tub installed, and at least some of the concrete board and drywall installed this weekend. Instead, I did absolutely nothing on this bathroom all weekend. Talk about frustrating! So once again, I’m in waiting mode. *Sigh* That seems to be a theme around here lately. Soooo much work but I know you are happy to see the end of that bathroom. Can’t wait to see how this turns out! How are your arms feeling? UGH!!!!!!! Nothing is more frustratrating that the “hurry up and wait” game…Just wanted you to know that my projects even though different from yours are getting finished because you inspire me to finish. Maybe you can work on condo while you wait…or did you consider the rental idea? Seconded! I’d love a new diet post! I just find the whole program you did so interesting and your results and maintenance on round 1 were really impressive! I’ve been following you for for a few months…where do you get the energy??? You are so motivating to me! 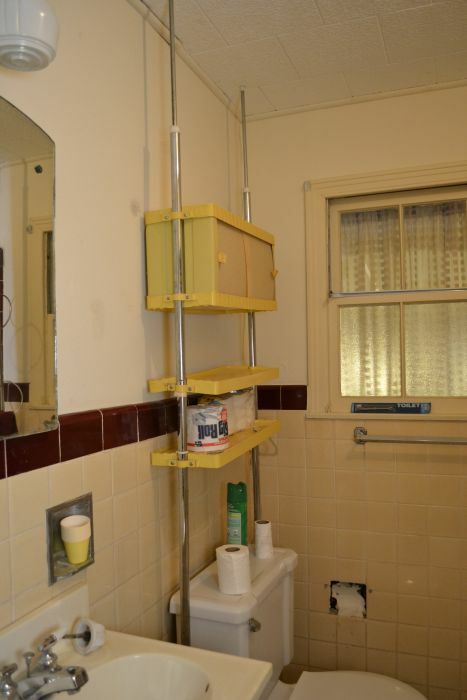 You mean you got rid of that yellow over-the-toilet shelf thing??? Haha. The bathroom looks better as it currently is than before. It will be great when done. Rest those arms, girl! Seems strange to say this but it looks better already! Maybe the rest until Friday is a good thing…for body and mind because once you start there will be (hopefully) no stopping you…and…it will look amazing. Kristi perhaps it’s a good time to take a rest… Recharge the batteries for the next “assault”…. Take some time for you and Matt… Just a thought…. 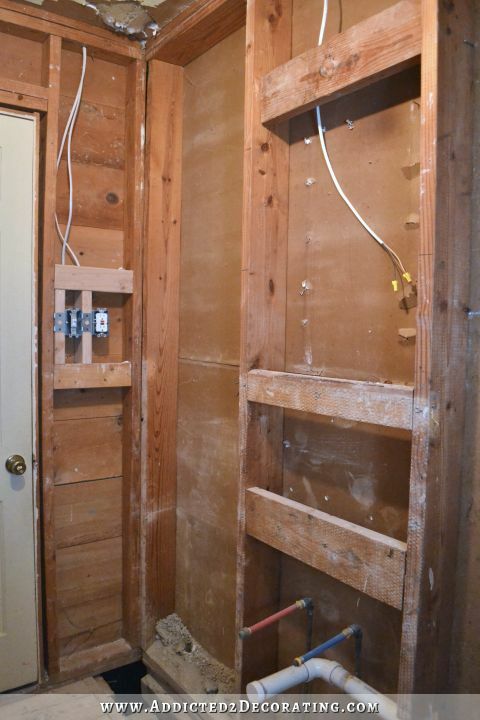 My husband agreed he’d start the demo on our master bath AFTER superbowl…..so here we go. ..today we start trying to remove curltured marble walls. I was hoping you weren’t going to put in a tub so I could pick you brain on how to go about doing our shower stall. UPWARD and ONWARD we go…. Just a question. I am looking forward to my “some day bathroom redo”. And one thing I’m looking forward to the most is a walk-in-shower. I’m going to take the tub/shower out and replace it with a walk-in-shower. It will be so much better, and I don’t have small children anymore, so I don’t need a tub. Anyway, yall don’t have little children, so I was just wondering since you already took out the old bathtub. Why not do a walk-in-shower? 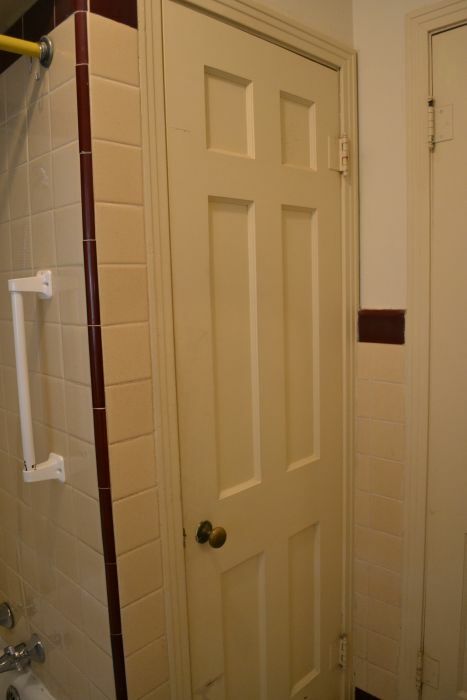 You know, a nice big walk-in-shower. Not one of those tiny ones. I can’t even tell you how much I admire you and enjoy your posts. I am learning so much! I can’t believe how much you do by yourself–unbelievable. Just wanted to say thank you for sharing and inspiring us!! Ugh! Nothing like uncovering significant problems. I’m so glad you have the warranty for the leveling. Maybe it’s a very very good thing that you decided to make this the final remodel after all? Don’t know the terms of your warranty, but it’s always better to find out about problems with a job sooner rather than later. Even though you are waiting on the outside contractors to do their parts, it’s still fantastic progress in my view. I am really eager to see how that lovely tile looks installed. Great work, as always, Kristi. I love following your blog. I am in awe of you, your amazing! 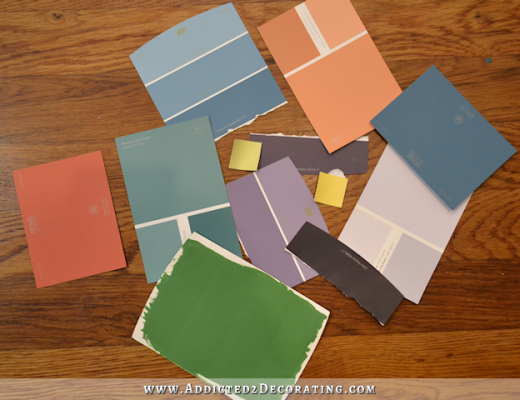 You are bringing this house back to life and that’s super amazing and extra special, I wonder if this previous owners follow along on the blog? Wow! For somebody who just posted a few days that you didn’t have the stomach or finances to start another big reno, you’ve gotten yourself in to one, for sure!! Looking forward to seeing your process. We just faced the same choice and decided to just refinish the tub. But I think in a few years we would like to replace it. 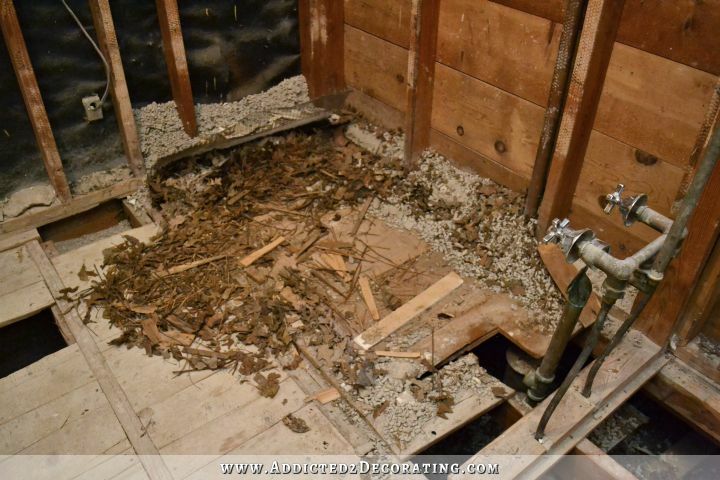 Can you be very detailed about the actual tub installation and the dry wall around the tub. Thank you. When your plumber returns, you can add shut off valves. That’s amazing work. Critters under the tub??? Oh my God, I never would have thought!! Just a thought while you wait (and while you can still take back the tub) . . Why put in another tub? If you want a soaking tub put one in your new master bath – make this a zero threshold shower . . guests probably won’t be taking long soaks and if you want one you would doubtless take it in your master bathroom so why waste the $$ on a tub . . instead ut in a really nice big shower. As I said just a thought and you didn’t ask . . If I were you, I would put insulation in those walls, even if they are inside walls. Bathrooms need to be extra warm, and it also cuts down on sound (bathroom noises). But at least the squirrel-guy waiting is over so you can finish what you interrupted before starting what you just interrupted? 😀 Also, I’m confused – why a tub? Weren’t you trying to make this bathroom accessible to Matt? Kristi, As always you amaze us !! I think it is good to have the waiting factor in play. 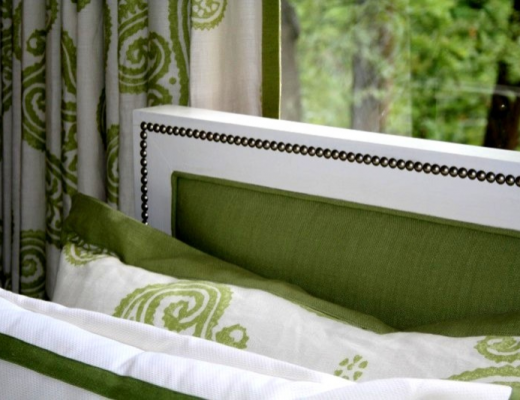 This will give your arms the much needed rest. Then you can work hopefully without needing to stop, ( except eating and sleeping ). Would love a update on your weight loss journey please. Looking forward to the bathroom project. I too, am wondering if you wouldn’t preference a shower here? Hahaha! I’m betting that while waiting for the house lifters, Kristie will have already removed the bathroom and dinning room ceilings and have them reinstalled! She’s a powerhouse!! “I think it is good to have the waiting factor in play” Are you kidding, lol, I bet she’ll have the bathroom and dinning room ceilings both out and at least well on their way to being reinstalled if not finished before Friday even gets here! That Kristie is a whirlwind!!. A couple thoughts (along with everyone elses): 1) When we put in a new tub we bought a “plastic” one (have no idea what material a non-porcelain tub is made of). It is a higher-end tub. The contractor put insulation UNDER the tub so as to keep the hot water hot when used for bathing. It also muffles the noise in the shower. 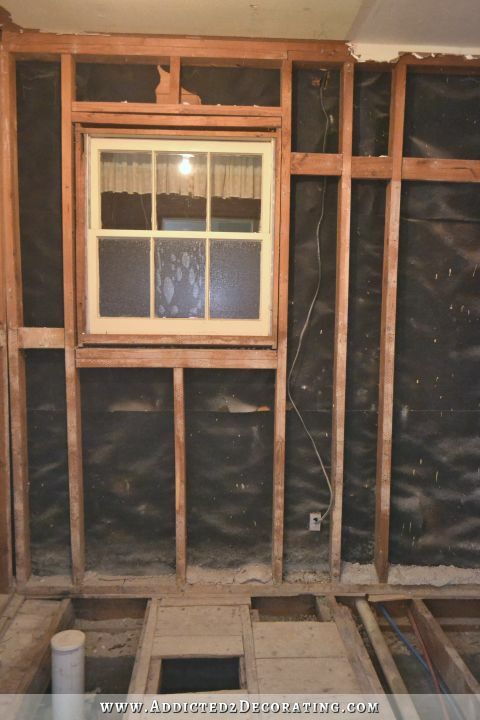 2) We used regular insulation in the bathroom walls. 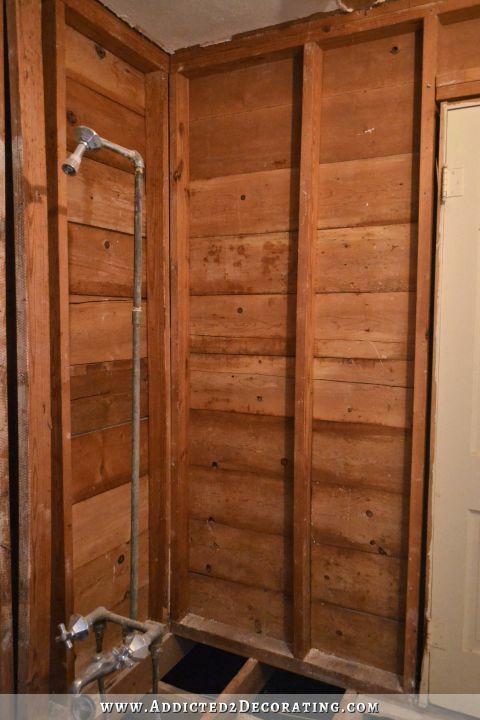 I think it might be bathroom specific, don’t know about moisture barriers, etc. Also makes a big difference in noise levels. 3) While everything in the tub area is open and accessible, might you consider moving the water lines from the current wall to the sunroom wall (to the left end as you face the tub area). You could then remove the current water line wall between the tub end and the former linen closet, opening that area up for more creative possibilities or just ease of creative logistics. 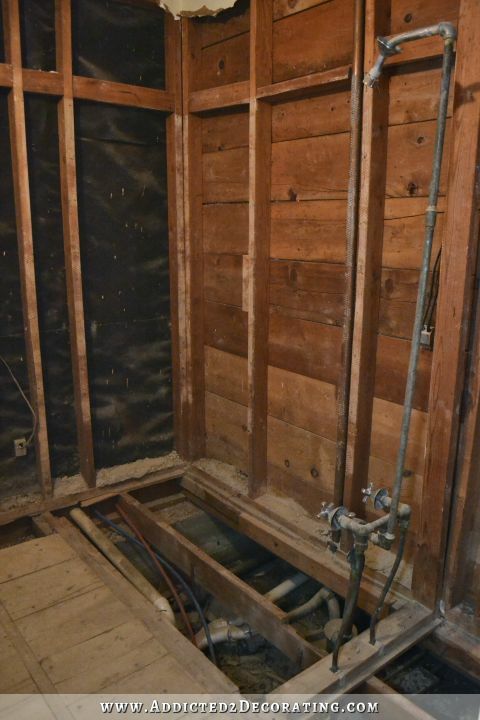 Several have suggested a walk-in shower in lieu of the tub. I think the space is too small for that. A friend did one in her tub space, building a wall on the outside edge with a row of glass blocks to allow light. The entry is at the left end, the faucet at the right, so you have to walk into the shower to turn on the water — which is a problem when cold water first sprays out, unless you can get out of the shower quickly enough until the water warms up. Her shower is pretty to look at, but rather like a dark cave, and water splashes out of the opening onto the floor. It was a good idea, but impractical for the tub-sized space. Put in a solar tube in the ceiling while you are renovating this room, that will provide natural daylight for you. I agree with Mae. We have a solar tube in our bathroom and LOVE it! You won’t miss the natural light from the window as much, when that is gone. At least with this stoppage of work you have time to really think about any extras/changes you want to make (extra insulation, change any plumbing etc) and get them done without disruption later on. I agree 100%. Definitely put in a solar tube while everything is opened up. Especially since the bathroom does not have an exterior window. The natural daylight will be wonderful. That extension arm on your mirrored cabinet is pretty cool and I could use something like that. If you’re junking or selling, I’d be interested. What with one thing and another. I have been looking at home renovations on a programe on the the TV. And the trend in a small bathroom is a Wet Room. So a big shower area would seem to be very practical for Matt. Anyway I’m sure you will finish this bathroom beautifully. Love your post have been following you, and love it. I second that. We have a wet room, which was orriginally built for a wheelchair user. It is great. Kristi, I bet you really sleep good at night! You work harder than most men I know! Keep up the great work! That is a huge amount of work! Great job! This is beginning to sound like And the Kitchen Started With A Light! Look forward to seeing what a luxurious bathroom shows up! Kristi, here’s an idea: when my parents added on a room outside their old bathroom, they sheetrocked over the window in the addition. 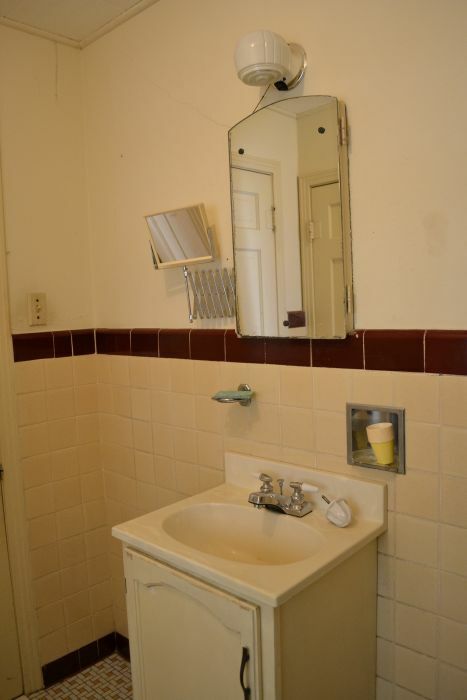 But in the original bathroom, they left the window in. They installed lights behind the glass, and replaced the transparent glass with translucent yellow marbled glass. It looked classy–not like a cover-up–and added a little more visual depth and light. How exciting! A fresh canvas! 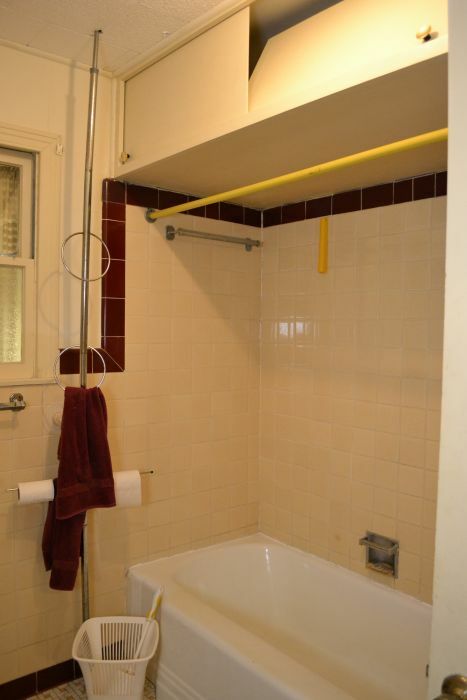 I see all the commenters recommending that you put in an open shower instead of another tub, I read where you already said you were going to eventually do an accessible shower for Matt in your Master, and this bathroom would be too small for Matt to wheel in and transfer into a shower anyway, so I get your thinking on that. BUT, I was really hoping you would discuss you decision on replacing the iron tub. I have that exact same tub (basically same exact bathroom!! ), and I don’t know whether to replace or try and re-coat mine. I have been given advice in both directions. Can you say why you decided to replace yours? I would love to hear your thoughts. Thanks for sharing your reno!! !